The Walter Camp Football Foundation has announced the Football Bowl Subdivision National Offensive and Defensive Players of the Week, presented by Generation UCAN, for games ending November 11. Malcolm Perry rushed for 282 yards (on 33 carries) and four touchdowns as Navy held off SMU, 43-40. With the win, Navy improved to 6-3, 4-3 in the American Athletic Conference. Notes: Malcolm Perry is the second Navy player to earn Walter Camp National Player of the Week honors since 2004, joining former Midshipman running back Shun White (Aug. 30, 2008). Jaquan Jackson posted eight tackles, including one for loss, and added one interception and one pass deflection as 10th-ranked Miami defeated third-ranked Notre Dame, 41-8. With the win, Miami improved to 9-0. 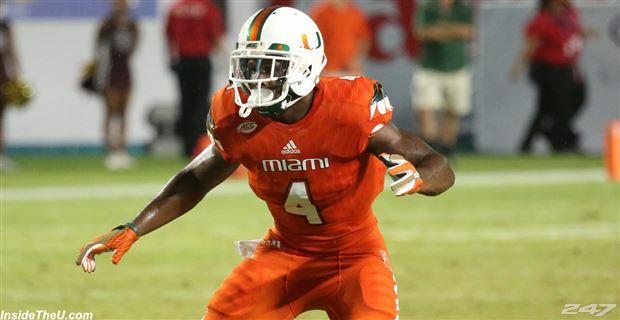 Notes: Jaquan Johnson is the third Miami player to earn Walter Camp National Player of the Week honors since 2004 (and second this season), joining quarterback Brock Berlin (Oct. 23, 2004) and linebacker Michael Pinckney, who was honored on Oct. 22, 2017. Generation UCAN (@GenUCAN) is healthy sports nutrition powered by a unique, slow-burning carbohydrate called SuperStarch. UCAN’s drink mix provides steady energy, allows you to burn more fat for fuel during workouts, and helps you recover efficiently compared to sugary sports drinks or a high carbohydrate meal. UCAN contains no added sugars, no caffeine, and is gluten-free. SuperStarch was originally designed to help children who suffer from serious energy imbalances and now fuels some of the top athletes in the world – ranging from professional football players, to Olympic runners, to everyday athletes striving for fitness. The UCAN Company is based Woodbridge, CT. Visit  HYPERLINK “http://www.generationucan.com” www.generationucan.com for more information.